Brant, what’s the craic, spec, availability……? I’m just writing words actually. The Titus Ti Fireline Evo29 is a progressive trail hardtail designed for tough fun trail riding, optimised around an 120mm travel suspension fork (526mm a-c, 15mm lower external headset cup). Fitted with ISCG05 tabs, a post mount rear brake fitting, replaceable rear mech hanger, the Ti Fireline Evo29 is a competent and contemporary model, designed to give a great ride for many years. Custom swaged tubing, cold worked by our craftsmen, hand welded, hand finished and checked by eye. No robots here. Geometry and frame fittings complement each other. Short, true, 17.1in chainstays balance the fore-aft weight perfectly whether up or downhill. Huge tyre clearance is assured thanks to the tapered bespoke chainstay c section, bracing the chainstays, increasing tyre clearance, guarding against chain abrasion, and yet using tubular Ti where necessary to keep weight down and stiffness up. With a static 67.7deg head angle at rest with an 120mm fork and external headset, the Fireline Evo uses our Mixer Taper standard and is compatible with all styles of fork, and even angle adjust headsets to fine tune the handling more. Seat angle sits around a pedal perfect 73degs when at “ride height” balancing perfectly with the short rear stays for maximum seated traction without looping out on climbs or “tri bike” like seating positions. It just flat hammers, flatters and eats up the terrain like nothing else. One set of bottle bosses allows seat dropping with ease. 30.9mm seat tube means dropper post compatibility. A triple chainset fits, as does 2×9, 2×10, 1×11. completed. Sea shipping. Here in 5 weeks. Fukkn spot on.. Order direct from on one I assume ? I don’t set pricing. But £799 isn’t a crazy idea. Any news on the new Ti456 evo?? and its availabilty……. Brant – Any news on the Ti 456? Lat time I asked it was ‘September’. When you say long top tube – how long is long? Brant, assume rear is normal 10mm quick release ? Brant, any more info on sizes and preorders, tried to post a question on the Titus site but it wouldnt stick? I think I have some housekeeping to do on the Titus site and your post is to be approved. Which I will then answer. Brant, whats the TT on the 20″? Rocketdog – it’ll be too big(dug) for you. I’d be interested in SH solaris too! 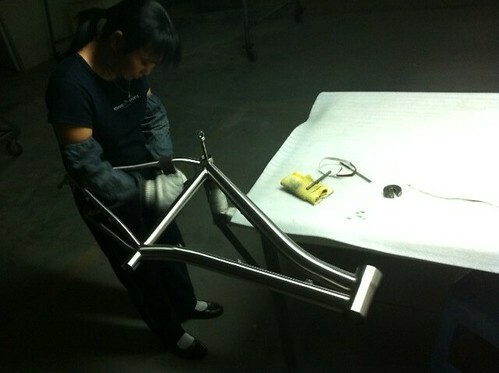 My Solaris has been dibbed, hopefully these come soon or i will be bikeless. Brant, please tell us it will be soon! Can anyone find anything on shedfire’s site? Anyone got the pics they can post up? Is that the DT ovalised… and the TT? DT ovalised. TT not really. Looks very nice, any better pics? Shipping out any day. Here in 4-5 weeks. Can you post up geometry & measurements. Will 100 travel reba’s work.